New Fourth Edition of Preferred Stock Investing! Readers of Preferred Stock Investing learn how to screen, buy and sell the highest quality preferred stocks. The Fourth Edition is now available at your favorite online retailers (see retailers). Published this year, the Fourth Edition of Preferred Stock Investing includes the latest research and updated charts and examples using real preferred stocks. And Part III "Buying When The Market Favors Buyers" has been completely re-written to focus on the buying conditions that we will be facing throughout 2011 and 2012. Check out the new Fourth Edition Table of Contents. The preferred stock investing method explained throughout the book - the "CDx3 Income Engine" - uses three rules and ten selection criteria to accomplish its three objectives: maximize revenue while minimizing risk and minimizing work. The results are itemized in chapter 15 for every qualifying preferred stock issued since January 2001 - ten years worth of the highest quality issues. A new chapter has also been added (chapter 11, "The Crisis That Keeps On Giving") that describes two specific opportunities for preferred stock buyers. Both of these opportunities were created by the 2007 - 2009 Global Credit Crisis and are expected to remaining available well into 2012. Preferred Stock Investing is one of the highest reader-rated books available at Amazon and sells within the top 2% of all book titles in the United States. Look for your copy of Preferred Stock Investing, Fourth Edition at your favorite online retailer. A rare "perfect market" for the highest quality preferred stocks materialized during October that is providing investors with choices from a very diverse array of industry segments. High quality preferred stocks are those that have a variety of risk-lowering provisions such as the "cumulative" dividend requirement (meaning that if the issuing company misses a dividend payment to you they still owe you the money; their obligation to you accumulates); investment grade ratings (as opposed to speculative grade) and are issued by companies that have never suspended a preferred stock dividend (see chapter 7 of my book, Preferred Stock Investing, for a complete list of selection criteria). The average market price for the highest quality preferred stocks was $25.02 for October. That's an important number since an average share price at (or very near) $25.00 signals a "perfect market" for these securities. Like most things, the market for the highest quality preferred stocks is rarely perfect, but it was during October 2011 and, as such, brings an important opportunity for preferred stock investors. A perfect market for the highest quality preferred stocks means that the buyers and sellers of the world have not only reached agreement on the value of such securities, but the value they agree on is equal to the "par value" ($25 per share in this case). You can think of the par value of a preferred stock as the mid-point of a teeter-totter with one side favoring buyers while the other side favors sellers. Market events put weight on one side or the other, raising or lowering the return ("yield") of your preferred stock purchase. When the average price of high quality preferred stocks reaches par the marketplace for these securities favors neither buyers nor sellers - a very rare balancing point has been achieved. And in this case, this rare equilibrium has resulted in an interesting opportunity for preferred stock investors who may be looking to diversify their portfolios. If your preferred stock portfolio is over-exposed to banks, for example, this would be a good time to consider diversifying into non-bank segments. 2. By purchasing shares for less than $25, shareholders will add a nice capital gain, in the event of a call, to the average 7% annual dividend income that these high quality preferred stocks are generating. Like all averages, a value of $25.02 means that the prices of some high quality preferred stocks were higher while others were lower. We're after the ones that were lower - the highest quality preferred stocks trading on U.S. stock exchanges that are available for a purchase price less than $25.00 per share. The list of high quality preferred stocks that are currently available for less than $25 per share can be seen in one mouse click using the Preferred Stock ListTM tool on the CDx3 Notification Service website (my preferred stock email alert and research newsletter service). Figure 1 shows the result as generated after the market closed on November 1, 2011 (note that to protect the values of subscriptions to the CDx3 Notification Service trading symbols are obscured here). There are several interesting things to notice about this "perfect market" list. First, the average market price of these 21 high quality preferred stocks is $24.10. So buyers of these issues will realize the principal protection and potential capital gain benefits described above regarding shareholders who purchase below par. 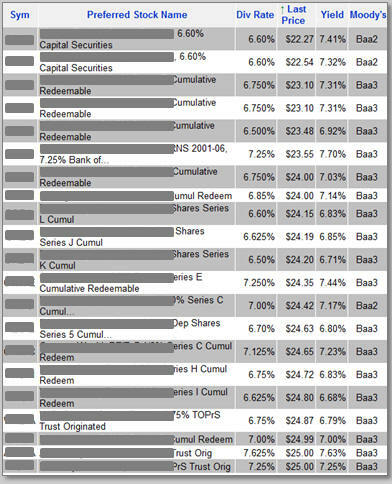 Second, while the average declared dividend rate ("coupon") of these 21 high quality preferred stocks is 6.85%, the dividend yield (which is the annual return you earn on the money that you have actually invested) is 7.11%. Not bad at a time when the average bank Certificate of Deposit is paying less than 2% (source: bankrate.com) and corporate bonds are paying about 4% (source: federalreserve.gov). Third, the 21 high quality preferred stocks that you see listed in Figure 1 are issued by companies across a surprisingly diverse collection of industry segments. At any point in time, market events tend to affect preferred stock issues from some industry segments more so than others and that is frequently reflected in this list. During the Global Credit Crisis, for example, banks dominated the list of sub-$25 issues. But for the current "perfect market" the industry segments represented here are much more diverse. Diversification During A "Perfect Market"
High quality preferred stocks are issued by companies from eleven industry segments as listed in Figure 2 (Preferred Stock Investing readers will note that this table provides an update to the list presented on page 130 of the book). Of the eleven industry segments represented by high quality preferred stock issuers, the 21 high quality preferred stocks that are currently available for less than $25 per share (November 1, 2011) cover seven segments. This is a higher degree of diversification than we normally see where this list would tend to be dominated by preferred stocks from specific segments depending on market events occurring at the time. The market for the highest quality preferred stocks has reached a rare "perfect market." If you are looking to add a diversified collection of such securities to your income-generating portfolio this rare condition has delivered an excellent opportunity for you to do so. Preferred Stock Investing includes the information, websites and other resources needed for you to be a very successful preferred stock investor. The new Fourth Edition is available at your favorite online retailer. For those who would rather someone else do the research and calculations, I offer the CDx3 Notification Service. Subscribers to the CDx3 Notification Service receive an email alert when there are buying and selling opportunities coming up. Subscribers also receive their own non-promotional preferred stock research newsletter every month, have their own website that hosts the CDx3 Preferred Stock Catalog and have access to the CDx3 Discussion Group, the only online forum just for preferred stock investors. Since the Big Bank Trust Preferred Stock (TRUPS) opportunity was created by the Wall Street Reform Act on July 21, 2010, every issue of the CDx3 Newsletter has allowed readers to watch the opportunity unfold in this article. On October 3, Wells Fargo retired WCO and WB-D in response to the Act, becoming the latest Big Bank to deliver on the Big Bank TRUPS opportunity first described to you here sixteen months ago. Depending on your purchase price, WCO and WB-D delivered annual returns to those of you who took advantage of this opportunity of at least 8.625% and 7.850%, respectively. The five Big Bank TRUPS listed here are providing an average yield of 7.4%. While the number of high quality preferred stocks appearing on this month's list is the same as last month (5), the specific issues are different due to the effects that uncertainty throughout the eurozone is having on our Big Banks. For new readers, here is a summary of what this opportunity is all about. Section 171 of the Act disallows Big Bank TRUPS from being counted toward the bank's reserves ("Tier 1 Capital") beginning January 1, 2013. Since this is the primary reason these banks issued these preferred stocks to begin with, Big Banks are highly likely to retire these preferred stock issues as the implementation date approaches. Investors purchasing shares for a price less than $25 position themselves for a nice capital gain (on top of the dividends these pay) since shareholders will receive $25 per share in cash in the event of a call. Each month the list of high quality Big Bank TRUPS that are available to be purchased for less than $25 per share is published here (with trading symbols and descriptions obscured). Since market prices change every day, the list of affected TRUPS selling for less than $25 per share changes as well. These are the highest rated, highest quality issues that are going to be among the first affected by section 171 of the Act that are also selling for less than $25 per share right now. (Already a subscriber? For symbols see page 7 of the November 2011 issue of the subscriber's newsletter, CDx3 Research Notes). W.R. Berkley is a $4.6 billion international insurance company founded in 1967 and headquartered in Greenwich, Connecticut. The company is organized into five business segments: specialty insurance, regional property casualty insurance, alternative markets, reinsurance and international. On October 27, 2011 WRB announced its Q3 financial results. 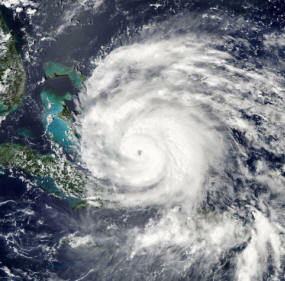 Those who follow the insurance industry were anxious to hear what the company had to say since the results from August's Hurricane Irene would be disclosed. Wall Street analysts who follow the company were expecting net income per share to come in around 39 cents per share on revenue of about $1.24 billion for the quarter. The costs from Irene and several Midwest extreme weather events during the quarter, as it turns out, were not as steep as feared. As seen in this table, WRB's actual results for Q3 came in at 53 cents per share on revenue of $1.3 billion. Another key announcement was that the company was able to post a 14% increase in net premium revenue written during the quarter with most of this growth coming from its international segment. This increase was achieved through an increase in premium rates of about 3% without losing customers. Insurance companies make money by investing premiums that do not get paid out against claims. W.R. Berkley is known as a conservative investors, holding about 80% of its investment portfolio in the form of fixed maturity securities. But today's very low interest rate environment is creating revenue pressure. While investment returns have stabilized, company chairman and CEO William R. Berkley stated that "...Given the current interest rate environment, the industry needs significant price increases in nearly all lines of business in order to achieve even minimally adequate returns." The company closed its last fiscal year with a profit margin of 8.05%. Learn more about WRB: Company website | Profile | Upgrades/Downgrades | Recent News. When does the 'call date' of a preferred stock occur? It is important for preferred stock investors not to confuse a preferred stock's "maturity date" with its "call date." The maturity date, for preferred stocks that have one (not all issues do), is similar to the maturity date of a certificate of deposit that you might purchase at your local bank. On the maturity date, the issuing company will purchase your preferred stock shares back from you at $25.00 per share, regardless of what you originally paid and regardless of the then-current market price. Buying your shares back from you is referred to as "liquidating" your shares and the price that the issuing company will pay you on the maturity date is called the "liquidation preference" (one of many unnecessarily confusing investing terms). For most preferred stocks that are targeted at individual investors, the liquidation preference amount is $25.00 per share. Having said all of that, individual investors often ignore the maturity date because it is generally set so far out as to have little impact on today's investing decisions. It is not uncommon for preferred stock maturity dates to be 20 to 30 years from the date of issue. Most investors are more interested in what might happen in a closer timeframe. That's where the call date comes in. The question this month for preferred stock investors: When does the 'call date' of a preferred stock occur? (A) Five years after the preferred stock is first introduced. (B) Five years after the first dividend is paid. (C) Five years prior to the maturity date of the preferred stock. 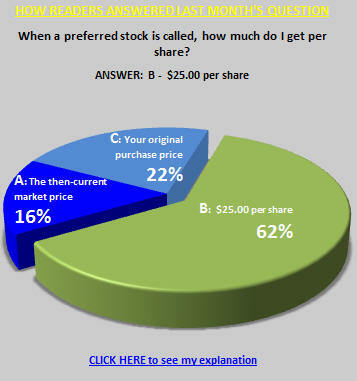 The correct answer to this question is (A), five years after the preferred stock is first introduced. For the first five years of a preferred stock's life, the issuing company is required to continue paying you the dividends specified within the issue's prospectus (see the exception below). Even if prevailing dividend rates in the U.S. economy change after the preferred stock shares are issued, the issuing company must continue to pay you your dividends as specified in the prospectus. But once the call date arrives, five years after introduction, the issuing company regains the right to purchase your shares back from you. Whether or not the issuing company calls a preferred stock issue is often determine by whether or not the company can save dividend expense by doing so. And the savings do not have to be as much as you might think. In fact, if the issuing company can save as little as .375% by issuing a new preferred stock at a lower dividend rate and use the proceeds to call an older, higher-paying issue, there is a 91% chance that they will do so (see Preferred Stock Investing, pages 211-212). Section 171 of the Wall Street Reform and Consumer Protection Act provides another reason that a company will call a preferred stock. This section of the Act eliminates the primary reason that Big Banks issue, and continue to pay dividends on, trust preferred stocks (one of the three kinds of preferreds and the one that is most favored by banks). Starting January 1, 2013 Big Banks will no longer be allowed to count the value of their trust preferred stocks toward their "Tier 1 Capital," a measure of their reserve strength. Because of this new law, it is highly likely that our Big Banks will call their trust preferred stocks as their respective call dates arrive, starting with trust preferred stock issues with call dates on or before January 1, 2013. Shareholders will receive $25 per share in the event of a call. So investors who purchase shares today for less than $25.00 per share position themselves for a nice capital gain, in addition to the great dividend income, in the event of a call. Exception: As of October 15, 2011 there were five high quality Big Bank TRUPS (i.e. TRUPS issued by our Big Banks that meet the selection criteria from chapter 7 of Preferred Stock Investing) that can be called prematurely; that is, they can be called at any time regardless of their published call date. The prospectus of these securities includes a provision that allows the bank to issue a call if the government changes the rules regarding how Tier 1 Capital is calculated (which is exactly what happened when the Act was signed into law in July 2010). There were originally nine such TRUPS but four of those have either been prematurely called already or have now reached their published call date. That leaves five high quality Big Bank TRUPS that can be prematurely called at any time. For a list of the targeted trust preferred stocks that are currently selling for less than $25 per share, including the Big Bank TRUPS that can be prematurely called, please consider subscribing to the CDx3 Notification Service today. 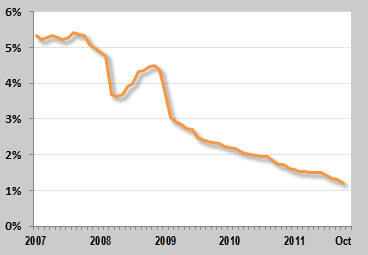 Savers who switched to longer-term bank CDs have just been thrown under the bus by the Federal Reserve. The Federal Reserve announced in August that they are committed to keeping short-term interest rates at zero at least until the middle of 2013. Last month's issue of the CDx3 Newsletter provided you with a look at how the Federal Reserve's short-term rate policy has decimated savers, primarily those with deposits in money market and certificate of deposit accounts. This chart updates the 24-month bank CD chart presented in last month's newsletter. To further the goal of economic stimulation the Fed really has no other choice. The last things businesses need is an increase in their costs when accessing short-term credit. Lowering the cost of short-term credit is great for businesses like retailers who pay that cost for unsold inventory that they are unable to turn over quickly. On November 2, 2011 the Fed confirmed an earlier announced policy to extend their rate-lowering efforts to include longer term interest rates. This policy is intended to benefit businesses that leverage borrowed money over a longer period of time such as real estate investment trusts (REITs). While the Fed's short-term zero interest rate policy has been good for REITs, extending this policy to include longer term credit is even better. Extending their policy to include long-term rates delivers the cost lowering benefit to a much wider collection of businesses. The downside to this policy is that investors who have chased yield into longer term bank CDs have just been sacraficed. While the Fed's short-term rate policy has pushed short-term bank CD rates under two percent (see chart), applying the same policy to longer term rates should have the same effect on longer term bank CDs. The highest quality preferred stocks issued by REITs allow risk-averse fixed-income investors to take advantage of the new Fed attack on longer term interest rates. As shown in Figure 2 at the top of this newsletter, the current "perfect market" for high quality preferred stocks has pushed several REIT-issued preferreds into the spotlight. These issues are currently delivering an annual dividend yield of about 7% and the companies that issue them just received a huge gift from the Federal Reserve. Thank you very much for your interest in my research. As always, I look forward to reporting back to you in next month's issue of the CDx3 Newsletter. Preferred Stock List, CD Times 3, CDx3, CDx3 Income Engine, CDx3 Investor, CDx3 Portfolio, CDx3 Preferred Stock, CDx3 Perfect Market Index, CDx3 Bargain Table are trademarks of Doug K. Le Du. All rights reserved.